The US Department of Commerce (DoC) has announced the final results of the 12th Period of Review (POR 12), lowering the anti-dumping tariff on shrimp imports from Vietnam. The POR 12 took place from February 1, 2016 to January 31, 2017. Specifically, shrimp exported by Sao Ta Foods JSC (FIMEX VN), the only mandatory respondent in the review, and over 30 other local shrimp exporters are subject to an antidumping duty of 4.58%. This final rate is far lower than the preliminary rate of 25.39%, first announced by the DoC on March 8. It is also slightly lower than the duty was in the prior period. Ho Quoc Luc, Chairman of the Directorate Board of Fimex, said Fimex cooperated fully with the DoC during its inspection and delegation period. In 2017, the export value of Vietnamese shrimp to the US fell 7% from the previous year because of the hefty anti-dumping duty. Meanwhile, the export value to other markets rose sharply, hitting US$659 million, according to the Vietnam Association of Seafood Exporters and Producers (VASEP). As a result, the US lost its spot as the fourth largest importer of Vietnam’s shrimp. The export decrease continued in the first eight months of 2018, falling 10.5% to about US$372 million. 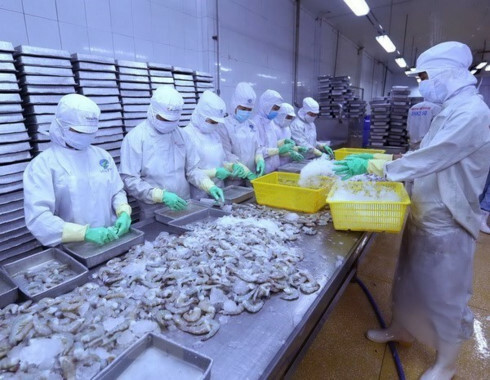 With the new lower rate, Vietnam’s shrimp exports to the US are expected to recover in the coming months. Despite the expected rebound, the final number is expected to be 6.5% lower than it was in 2017.